Given how much I enjoyed last year's Magic: An Anthology of the Esoteric and Arcane, I was definitely eager to sample another batch of tales, as selected by Jonathan Oliver, when this one crossed my desk. 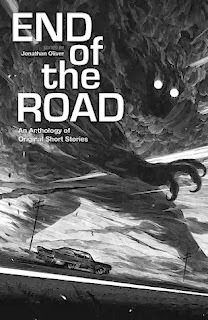 While I didn't enjoy it quite as much, The End of the Road: An Anthology of Original Fiction is a very strong collection, and one that's exceptionally diverse in the range of both roads traveled, and authors included. In fact, readers looking for something new and original will find a lot to like in this collection. The authors selected by Oliver here literally take us around the world, and though a wide variety of mythologies along the way. For me, the collection stumbled a bit getting on the road. 'We Know Where We’re Goin' by Philip Reeve may very well be a fascinating story, but I found myself turned off by the fragmented pidgin sort of English in its narration, and just didn't have the patience to continue with it. Fortunately, if we misfired on that first tale, Fade to Gold by Benjanun Sriduangkaew got the literary engine running just fine. It's a tale of Thai history and mythology, and one that plays a bit with gender expectations along the road. Some of the language and the imagery here was quite exquisite, especially in the final, sun-tinged scene. Without a Hitch by Ian Whates was another solid, unsettling sort of tale, the kind of story that reminds you of just why it's such a bad idea to pick up hitchhikers. Of course, there's a slight paranormal twist here, but it's one that doesn't hit you until the end. The next tale didn't make much of an impression on me, leaving me with a bit of highway hypnosis, but Driver Error by Paul Meloy definitely pulled my eyes back to the road. It starts out so simply, with a father going to pick up his daughter from a party gone wrong, only to witness a horrific hit-and-run along the way. Meloy does a great job of painting the scene and putting us inside the father's head, but then refuses to take the story where we expect it to go. In fact, it turns out to be a time-jumbled pretzel of a tale that still gets better and better the more I think about it. After another soft entry, during which I fiddled with the radio and adjusted the mirrors, The Track by Jay Caselberg put my hands firmly back on the wheel once again. It's a rather simple story of a vehicular walkabout through the barren deserts of Australia. It's almost as full of foreboding as it is heat and dust storms, but the grinning dingo at the end makes it all worth it. This time, it was two tales in a row that drove me to distraction, but I found the edges of the highway again with The Widow by Rio Youers. To say much about this is to spoil the surreal sort of way in which it unfolds - punctuated by some of the simplest, most graphic scenes of torture imaginable - but it's a fantastic tale of loss, grief, madness, and revenge. Once again, it seems I took my eyes from the road for a pair of stories, but Bingo by S. L. Grey jolted me back into alertness. In a story that's reminiscent of Driver Error, it starts out rather simply with a close call and a little road rage that turns out to be somewhat delayed. It's an interesting twist on the tale of the Good Samaritan, and one with a really creepy final scene of children at the highway fence. After one final story forgotten on the side of the road, Adam Nevillblah brings us to the end of our journey with Always in Our Hearts. Just as Bingo hearkened back to Driver Error, this one has echoes of The Widow, except here we're on the other side of that madness and sorrow. In a story that has a very sort of Twilight Zone feel to it, we know we're being taken for a ride, but we cannot begin to imagine what sort of darkness awaits us at the end. Detours and distractions aside, the stories that worked for me here worked very well indeed. It's those two pairs of complimentary stories - Bingo & Driver Error and The Widow & Always in Our Hearts - that I think encapsulate the anthology the best. They're the stories that remind us that sometimes roads come to resemble one another, and sometimes one journey may evoke memories of another, but they rarely take us to exactly the same place twice, and never in exactly the same way. 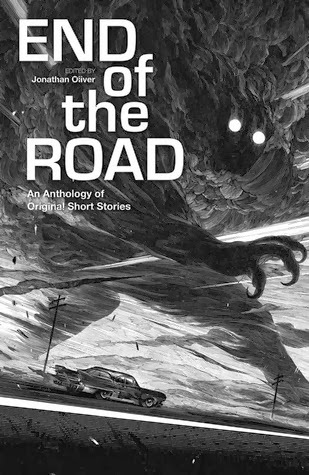 The road indeed "goes on forever" as Meloy reminds us in his tale, which is fine, because sometimes it's the remarkable journey that make the The End of the Road worthwhile.